The Wasteland can be a lonely place, but you don't have to brave it alone. In Fallout 4, you can go solo, or choose from more than a dozen potential companions. Sure, they may get in your way, and a few of them seem like the type of people who will always steal the remote or ask you to grab them a drink right after you get back from the kitchen, but they make the process a little more interesting, and a little less lonely. Californian artist Jillian Bakos has created some fun and cute Fallout 4-inspired Valentines, appropriate for all the companions in your life. Here are 8 of my favorites - and who I imagine the best recipients would be, with minor character story spoilers. 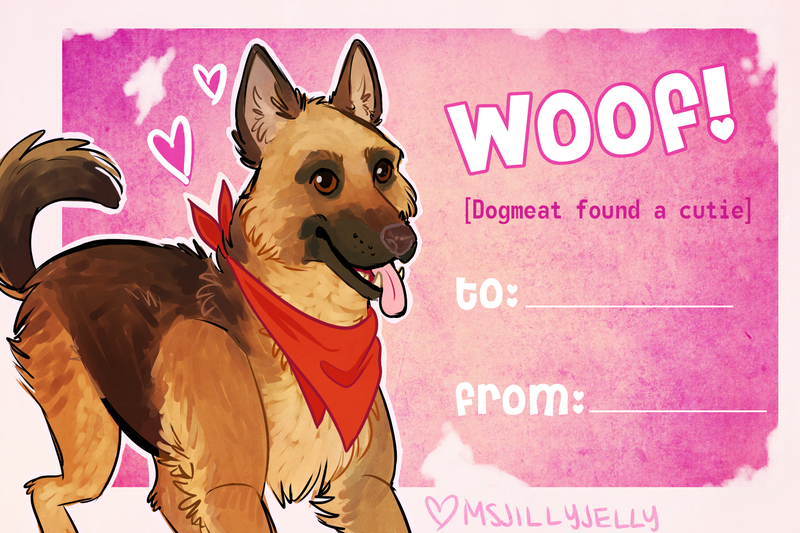 You can check out Jillian's art blog here for more of her work, as well as a full look at all of the Fallout 4 Valentines. Good ol' Dogmeat kicks off today's gallery because he is the best of the best. He may not be the most valuable companion - he certainly can't hack computers for you or wave around a gun - but what he lacks in usefulness, he more than makes up for in awesome cuddles and unwavering loyalty. No doubt we all have someone in our lives who fits that mold.